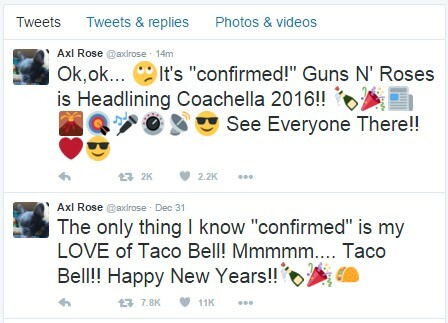 The tweet followed an announcement by The Coachella Valley Music and Arts Festival that the lineup for the festival would include Guns N’ Roses, LCD Soundsystem, Calvin Harris, Ellie Goulding, Ice Cube, Disclosure, Sia, and dozens of other bands. NEWS BRIEF: A security source in Anbar province has reported that a car bomb targeted the western entrance to the city of Fallujah Saturday. An evacuation is underway at Lakebay Marina due to shots being fired in the air by a man who has claimed to have a bomb strapped to the fuel and propane tanks on his 30-foot cruiser boat, docked at the marina. The man has been sitting on his boat and has threatened to blow up the marina, according to investigators, KOMO News, which originally broke the story, reported. At around 3 p.m. local time, a 56-year-old man began firing shotgun rounds into the air from his boat, according to Det. Ed Troyer of the Piece County Sheriff’s Department, and SWAT and other police units are now on the scene, which is reported as secure. Troyer said local police did not know the man previously, and that the man did not have a criminal background. Police are attempting to access the nature of the threat posed by the man.